The sheer volume of platforms and devices your consumers are using to discover, consume, and interact with content online is staggering. Across social networks and websites, on mobile and in voice-only interfaces and more, Americans are consuming 3,138,420 GB of data every minute of the day. Marketers are doing their part to feed the need. Wherever those consumers are – in search, social media, browsing their favorite sites, in apps – they’re being bombarded by a massive volume of content at every turn. We’ve become prolific content creators, publishing 473,400 tweets, 49,380 Instagram posts, and 1,944 new Reddit comments per minute. By 2020, we’ll be creating 1.7 MB of data per second for every person on Earth. Guys, I’m exhausted just reading about it. In the face of such massive noise and competition, how can your content possibly stand out? 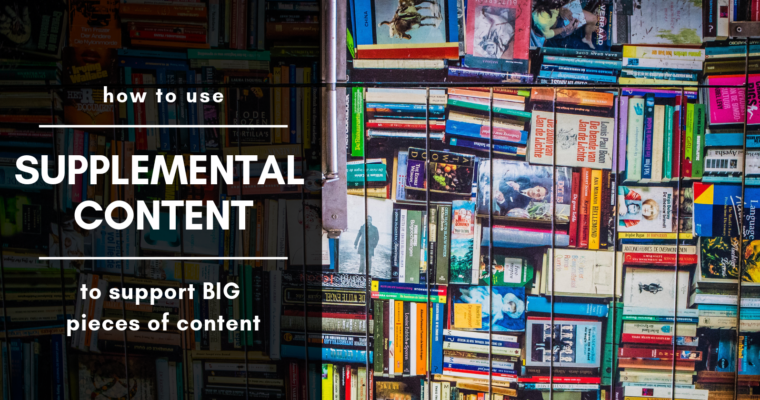 In this post, we’re going to explore the value of great, big content pieces and the creative ways you can use supplemental content to support them. 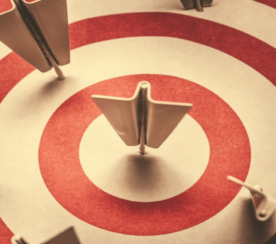 But first, why focus your efforts on big content pieces in the first place? For the purpose of this post, we’re going to use long-form blog content as our big content piece – that is, blog posts over 1,000 words in length. Now, I understand that there are varying opinions on what exactly constitutes long-form content. Some marketers consider it to be anything over 700 words long, while others classify it as anything that is more than 2,000 words. I’m going with an arbitrary 1,000+ words. Well, not completely arbitrary, as Searchmetrics research tells us that the average word count of top-ranked content in Google is between 1,140-1,285 words. 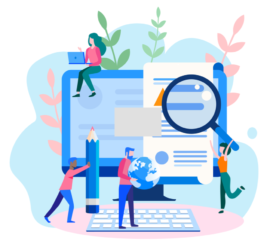 It’s also worth noting that big content pieces come in a variety of formats including whitepapers, ebooks, case studies, comprehensive guides, and more. Companies that publish 16+ blog posts per month get nearly 3.5x more traffic than those that publish 0-4 monthly. Marketers who prioritize blogging efforts are 13x more likely to see positive ROI. More traffic, greater leads, higher ROI, and happier customers? Yes, please. When it comes to long-form content, blogging is where it’s at. So Why Use Big Content Pieces? Aligning your content calendar around big content pieces gives your content marketing a campaign-based structure. It enables you to focus your efforts and resources in one area, maximizing the value of each piece. The massive value in properly executed big content makes it the ideal foundation on which you can layer supplemental content for the greatest ROI. Longer, in-depth blog posts generate 9x more leads than short ones, yet only 18 percent of companies’ blog posts are over 750 words. Another study tells us that 50 percent of bloggers who write long-form content report strong results… but only 8 percent of them actually do it. Capitalize on this untapped opportunity to outperform competitors. You’re not just competing against other businesses like yours for eyes and attention in the SERPs, though. You need to outperform every type of publisher out there – bloggers, news outlets, social content and more, in SERPs that are increasingly dominated by product listings, videos, and other multimedia content. 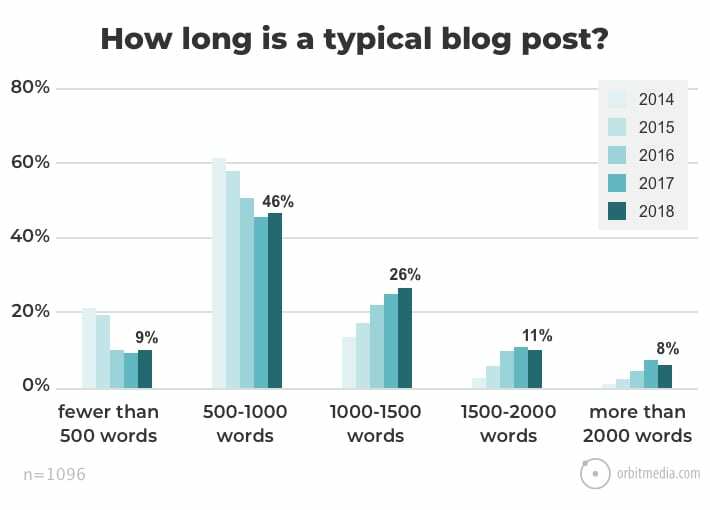 Overall, Orbit Media research states that the average blog post length is 1,050 words. You can see in the chart below that blog posts have been trending towards long-form over the last couple of years. Let’s see what all of this looks like in action, so you can use this strategy to create stronger and more productive content campaigns of your own. 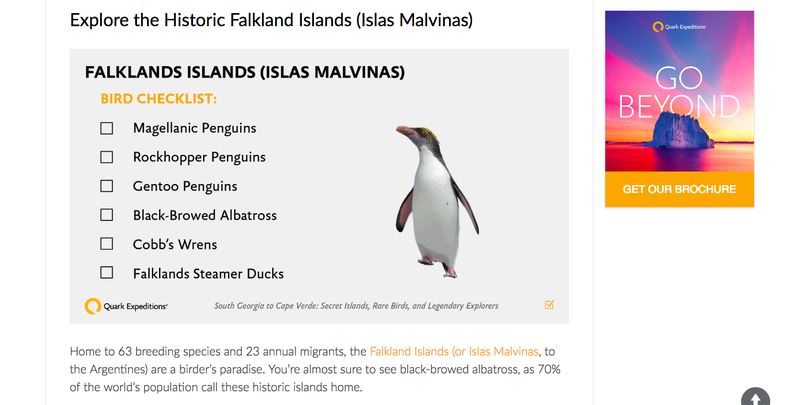 These supplemental content pieces enrich your main content object (the long-form blog post) but are also optimizable and shareable. Each of these adds to the big piece but has value on its own. Embedded images help break up dense text, tell your story in a visual way, and are helpful in SEO, as well. For supplemental content, you need to go beyond static photos or stock images to minigraphics or other storytelling aids with as much utility as visual appeal. The graphic adds utility to the larger post, but you could share this directly to Facebook and it would stand on its own, as well. Here’s another example, where a juice press brand has created image “cards” as an alternative format of presenting information about healthy city rankings. In both of these cases, the information could have been presented in text-only. That little extra bit of effort it takes to create images as supplemental content gives you an entirely new shareable piece of content to share in social media and help expand your blog’s footprint in the SERPs (via Image Search results and also images that Google pulls into regular SERPs). It’s fairly easy to resize these images for optimal display on various networks, too. Using Photoshop or Canva, you can resize your images for Facebook (940 x 788 px), Instagram (1080 x 1080 px), Twitter (1024 x 512 px), and more. Don’t forget to add them to your Google My Business albums, as well. 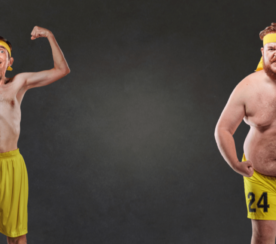 Check out 14 Important Image Tips You Need to Know for more on image optimization. 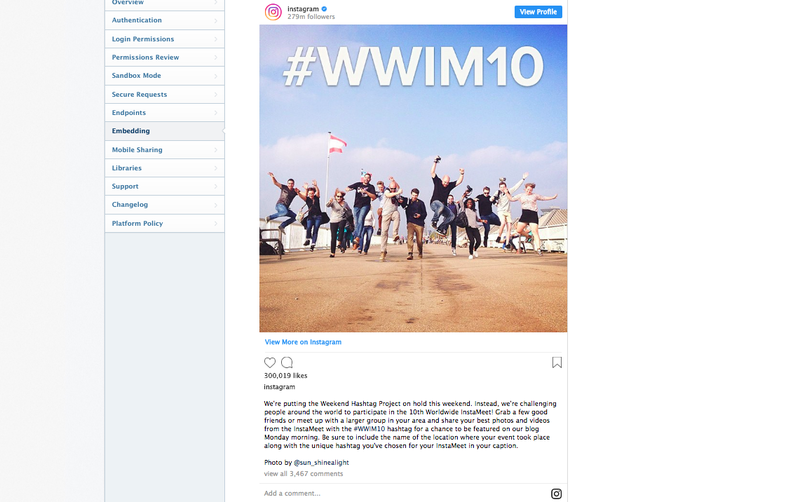 Adding posts from Instagram, Facebook, or Twitter is an easy way to add an element of interactivity along with visual interest to your long-form blog content. Or, embed posts from others to provide social validation of a point you’re making, cite them as a source of information, etc. YouTube is the second most-visited website in existence and now reaches more 18- to 34-year-olds than any TV network out there. You don’t need a huge production budget to publish YouTube-worthy videos, either. In fact, authentic videos tend to resonate better with YouTube audiences than commercial productions. In addition to the fantastic content they bring to your blog, YouTube videos can dramatically improve your visibility in search. 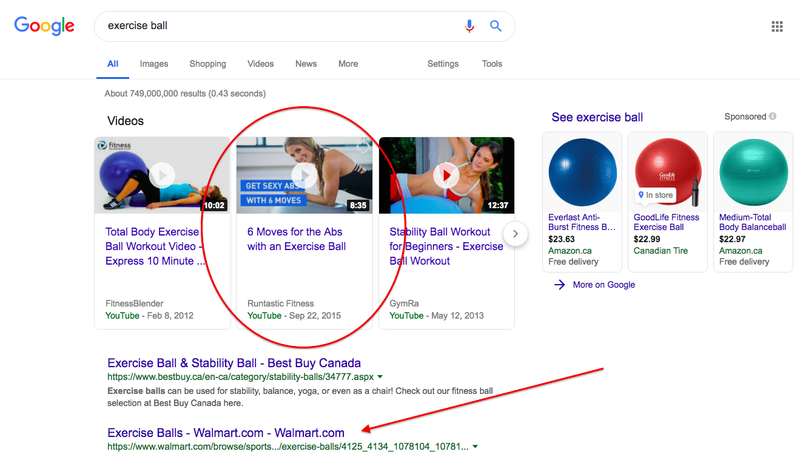 How else would a smaller business like Runtastic (a running coach and certified fitness trainer) dominate Walmart in the SERPs as in the above example? Maybe your reader is really into the content and wants to read or skim all the way to the end before deciding on their next step. Always give your audience the option to take the next logical step. Using buttons rather than plain text makes your CTA an appealing element that helps break up text, too. 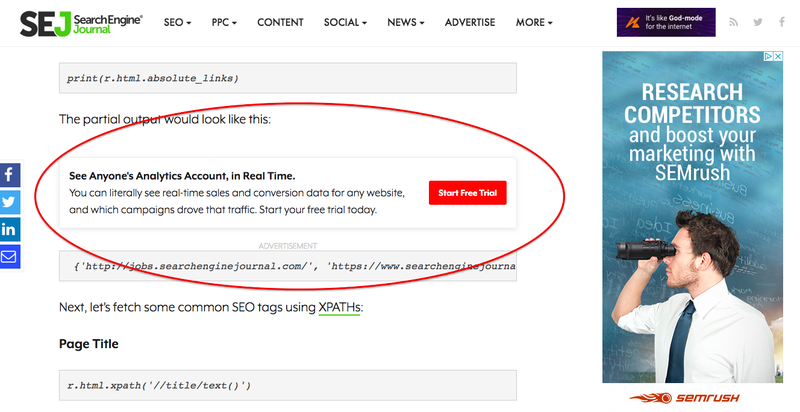 Ads inside your content, like the example above from here at SEJ, are a valuable commodity because they work. But if you’re running a business, you don’t want to look spammy or send traffic to someone else. Use this space and apply the same design principles to drive traffic to your own content, products/services, or offers. Use it to give visitors the option of taking that next step, if they’re ready. You don’t want to spam your visitors; rather, use this space to offer utility and added value. If I like the content in the larger piece, is there a clear next step I can take without having to go looking for it? Does everything on this page support me in my journey of making a decision and taking action? Does all page content speak directly to my needs? On desktop, your sidebar is a valuable piece of real estate. Are you using it to support users in taking their next steps? Use your sidebar to feature a lead generation piece that will help the reader access more in-depth information, even as they self-identify to you as a certain type of buyer. Anything you put in the sidebar appears on every blog page, so make it good. There are the basics you don’t want to overlook: search functionality, RSS feed subscription, links to your social media accounts. A (very) short tagline or another key brand message. For ecommerce sites, key conversion elements like your shipping options or product guarantee. 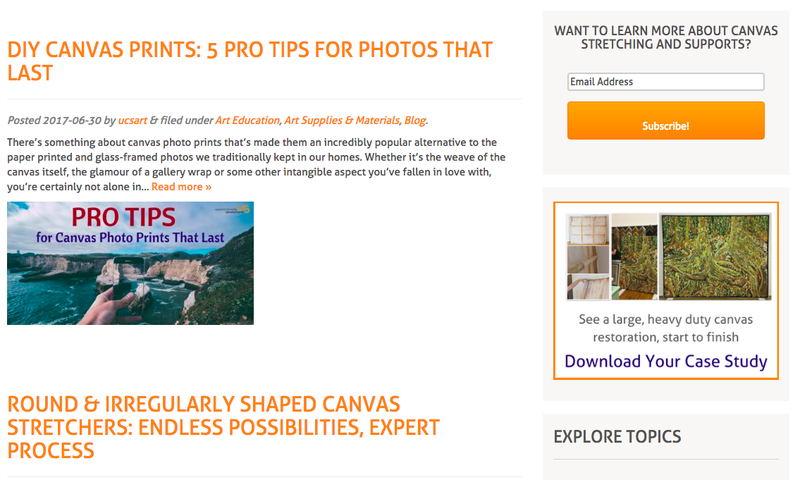 Featured content: your most popular or highest converting pieces. Any lead generation offers (a free trial, demo, etc.). Upcoming webinars or other events that give users a chance to interact. The misuse and abuse of pop-ups has given them a bit of a bad rap, but that shouldn’t keep you from using them to supplement your best content. Again, it’s all about adding value for your audience and using supplemental content to help them in discovery, decision-making, and taking next steps. Did you tune in to the overarching theme guiding each of these types of content? Ultimately, supplementary pieces of content fulfill specific needs at each point in your customers’ journey. This is why campaign-based content planning is so effective. You aren’t creating a piece of content and then trying to figure out what to do with it; from the onset, you’ve planned multiple complementary pieces with a purpose that all support a single goal. You understand what customer needs each component fulfills. With each piece of content, you understand what it is meant to do and what action you want your customer to take next. And wherever that content appears on your website, you are looking at the big picture – at how each element that user sees and interacts with supports their goals, and your business goals as a result. In this way, you might extend the life of a single concept – one large content object – by months. You’ll greatly improve its efficacy, and most importantly, you’ll have content tailored to appeal to different types of consumers in their discovery, consideration, and conversion decision-making moments. Questions? Fire away or share your own content planning tips in the comments.